Hand-wringing over Common Core has nearly reached a tipping point. Or so we can hope. Recently I read a post about how Common Core dumbed down public curriculum, and then I saw a post about how Common Core is raising expectations for student capabilities. Just for a moment, let's set aside the absurd notion that we should be using standardized tests to determine if a teacher is good at her job. Let's also set aside the ridiculous idea that teacher evaluation can be modeled after the way businesses execute performance and merit reviews. Never mind that such reviews might be done on a quarterly basis rather than an annual basis and that the reviews are based on the employee's performance based on specific goals and tasks associated with the employee's job and job description. Just for a moment, let's think about school reform. If you will, please, travel with me to MetaMetrics, an educational research and measurement organization founded in 1984. They've been doing studies and research on Lexiles and text complexity for over thirty years. Well before Common Core was even the germ of an idea. Major publishing and educational companies have been using Metametrics' work for reading assessments for decades. And they do work in mathematics, too. So what's the big deal about Lexiles and text complexity? I'm so glad you asked, but I'm going to focus first on Lexiles, which is only one component of text complexity. It is, however, one that's easily misunderstood. And please, PLEASE, keep in mind that Lexiles and the related research pre-date Common Core by a generation or so. The Lexile Framework for Reading was designed to help educators match students with texts. I know, this is horrible, but stay with me. The idea, as many reading teachers and reading specialists can attest, is to figure out a student's reading level and match the reading level with the reading level of the books the student is reading. If the teacher knows a textbook, for example, is above a student's reading level, he can figure out ways to provide supports for that student to be successful, perhaps even working with a reading coach or specialist. You know, like we've been doing for a decade or so. Please keep in mind, too, that MetaMetrics is not a Common Core stooge, though anti-Common Core conspiracy theorists will scoff at that. Keep in mind that reading levels and figuring out factors that can help kids read with better comprehension and fluency has been the stuff of education before educators even had words like "comprehension" and "fluency" to apply to reading instruction. What MetaMetrics helps teachers (and could help parents and politicians) understand is that there are many factors that influence a student's interaction with a text. That speaks to text complexity and more on that in a different post. When Harry Potter was all the rage, many of us knew kids who were reading the books who would not normally have lugged around a 700-page novel. The first Harry Potter book measures 880L, so it's an 880 Lexile book. Word frequency and sentence length are two factors that influence that level, but also the content, the age and interest of the reader, and more. Again, those also speak to text complexity. So what does that mean? As you look at the 2nd column of the chart, you'll see that 880 falls in the 6th grade but is also the leading anchor score for the 7th grade. An overlap makes sense for a lot of reasons. If you look at the 3rd column of the chart, you'll see the target reading levels based on Common Core and you'll note that 880 is in both 4th grade and 5th grade. Now think about the kids you saw lugging around that first Harry Potter novel. All those 4th and 5th graders. And that was 10 years ago! So those 4th and 5th graders were reading above their grade levels. They were reading at today's Common Core levels! Did they understand every word? Nope. Did they get the general idea of the story? Of course they did. And that is much of what comprehension is all about. "A high Lexile measure for a student in one grade indicates that the student can read grade-level-appropriate materials at a very high comprehension rate. The student may not have the background knowledge or maturity to understand material written for an older audience. It is always necessary to preview materials prior to selecting them for a student" (MetaMetrics). Now one more thing from a paper MetaMetrics published for Scholastic, yes, a purveyor of reading materials and reading assessments. 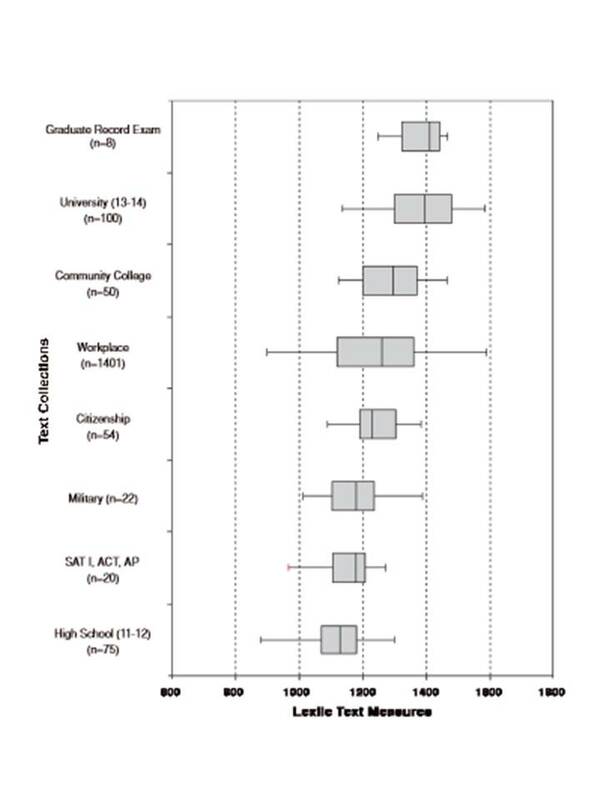 The paper was published in 2008, alas, before Common Core was on the scene and making all of those silly references to being ready for college and the work place. In 2006, the National Association of State Boards of Education had published Reading at Risk: The State Response to the Crisis in Adolescent Literacy. What they learned is that there was a gap between students' reading abilities and the requirements of college or the work place. That meant that students would be unprepared to be successful after they graduated from high school. 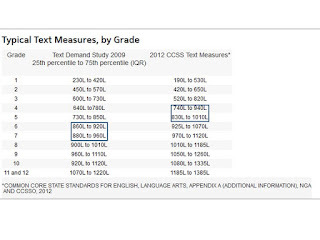 The study went so far as to measure that gap and, as shown in the chart from the MetraMetrics Scholastic study, identified the Lexile ranges of reading materials at certain levels. Even in 2008, the Lexile range for reading materials at the university level was about 1150 to 1600 with the majority of university-level materials between 1300 and 1500. 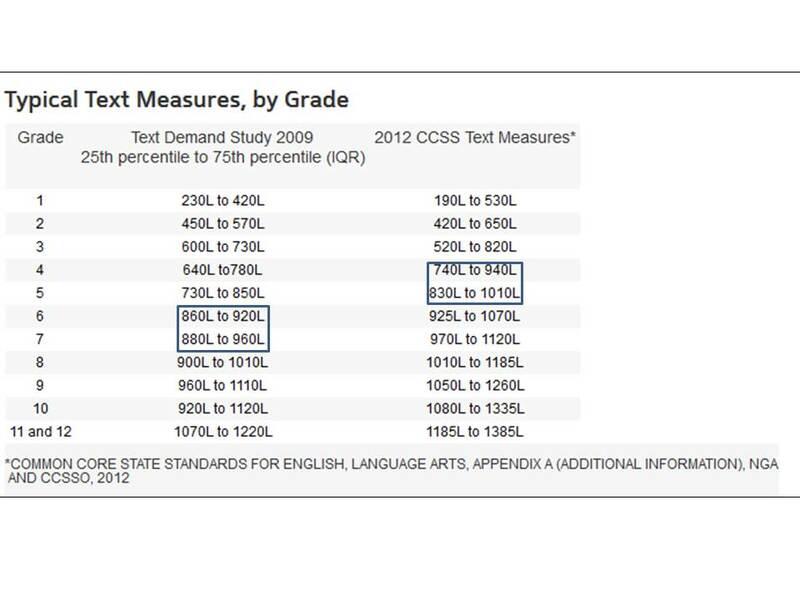 Go back up to that Lexile chart and see the target reading level for 12th graders in the 3rd column: 1185 to 1385. Just about enough to be successful in college. 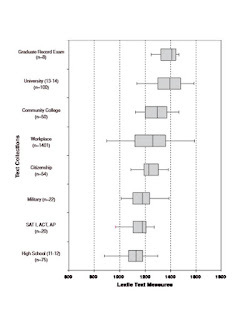 From a paper published in 1999, when a construction worker needed to read at a Lexile level of about 1080 and a teacher needed to read at about a 1400, the average high school student read at an 1150. Based on a study conducted of students during the 2010-2011 school year, most high school students were reading at a 5th grade level. Maybe Common Core isn't the perfect solution to the problem, but if it helps teachers and parents focus on this problem of reading capabilities, then more power to it.